Learn the art of pure meditation, create stress relief any time you need it, and learn how to stay anxiety free. 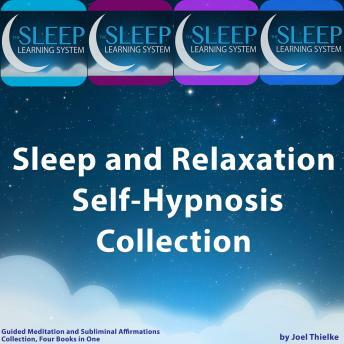 It's all here in this Sleep Learning System collection, from certified hypnotherapist, Joel Thielke. The Sleep Learning System is specially designed to work with your subconscious mind during your sleep cycle. The guided meditation and soothing background music will deeply relax your body and mind for the perfect night's sleep, while allowing you to get the sleep you need to recharge your mind and body. Create great sleeping habits, overcome insomnia, and deeply relax your body and mind so that you can sleep through the night and wake up feeling energized and ready to go. Achieve the purest form of meditation and inner peace. Learn how to focus and remain open during meditation. Learn the tools you need to create stress relief any time you need it, and relieve your body of any blocks or tension. Deep relaxation has never been easier! Put a stop to anxiety and panic attacks, and start living an anxiety free life. Learn how to stop anxiety before it starts, and deal with your emotions in a healthy and peaeceful way. Joel Thielke's guided mediation system gives you positive suggestions that will help you quiet your mind and melt away stress, leaving your body deeply relaxed for a great night's sleep. The special Sleep Induction will gently guide you into your REM stage of sleep, working with your subconscious to make lasting change in your sleep patterns that you can see. Start sleeping better today! You can do it, and The Sleep Learning System can help. I loved it. Slept through the night. Very good book for relaxation and insomnia.